The thrusters aboard the Voyager 1 spacecraft just did what we thought was impossible. After 37 years of inactivity, NASA just received response from spacecraft 13 billion miles away, NASA said in a statement on its website. Voyager 1 is NASA’s farthest and fastest spacecraft. It was launched on September 5, 1977. Having operated for 40 years, 6 months and 14 days as of March 19, 2018, the spacecraft relies on small devices called thrusters to orient itself so it can communicate with Earth. These thrusters fire in tiny pulses, or “puffs,” lasting mere milliseconds, to subtly rotate the spacecraft so that its antenna points at our planet. Now, the Voyager team is able to use a set of four backup thrusters, dormant since 1980. Definitely worth checking to see which apps have access to your data. It’s probably more than you think: On the desktop version go to Settings/Apps and make sure you click “show all”. Facebook has found itself embroiled in yet another colossal controversy related to how its sprawling, multibillion-person social network has been abused by bad actors. To celebrate the publication of this final volume of his diaries, Tony Benn, in conversation with author, columnist and commentator Owen Jones, reflects on both the public and personal events of the last five years. Covering the fall of New Labour, tireless campaigning against the wars in Iraq and Afghanistan and passionate commitment to encouraging public debate and demonstrations, A Blaze of Autumn Sunshine also provides a highly personal insight into the challenges of old age, failing health and widowhood. Finally, we share in Tony Benn’s hopes for the future based on his experiences, insight and his natural optimism. Tony Benn is the longest serving MP in the history of the Labour Party. He left Parliament in 2001, after more than half a century in the House of Commons, famously saying that leaving would give him more time to devote to politics. He is the author of many books including nine volumes of diaries and the childhood memoir Dare to be a Daniel. This event was organised in partnership with Newham Bookshop. It’s not everyday that we get a stop-motion film because stop-motion anything takes a heck of a long time to produce — but the end results are usually worth it. With Wes Anderson‘s highly anticipated Isle of Dogs hitting theaters on March 23, EW has an exclusive look behind-the-scenes of how a unique team of 25 animators and 10 assistants brought the vision of a canine-only island off the coast of Japan to life. 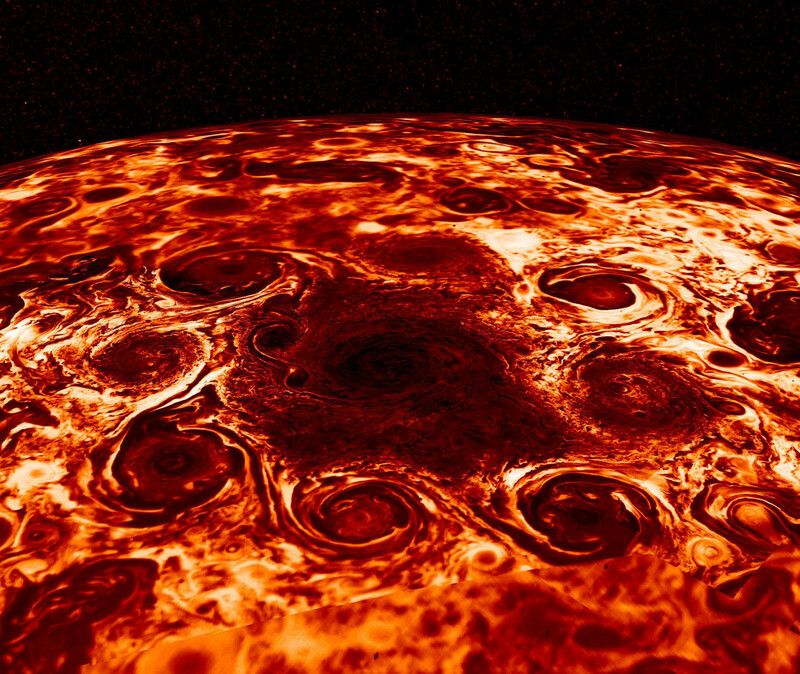 Scientists studying Jupiter using data and observations from the Juno spacecraft just released four new papers on their results, and I honestly can’t say what’s cooler: the science, or the jaw-dropping images. The research deals with Jupiter’s atmosphere. Jupiter is a gas giant, and when we see it we’re not looking at a surface at all, just the tops of its clouds. And even that is complicated, because the clouds are at all different heights. In some spots we see high-altitude clouds (sometimes shiny white due to ammonia ice that’s frozen out as the gas rises) and in some spots we see hundreds of kilometers deeper. I had a personal realization recently: kottke.org isn’t so much a thing I’m making but a process I’m going through. A journey. My influences have always been the old surreal films, the dream like quality of animations like ‘Inspiration’ by Karel Zemon to the impeccable detail and quality of the Betty Boop black and white animations. However, I have also always been a big fan of paintings, in particular the old masters and the Pre-Raphaelites. I really wanted to test out these different styles, like realism mixed with the surreal and bring it into the 21st Century with the different techniques I tried. 2 it’s important to educate the hand, attain obedience, to full fill ideas. but careful with perfection, to much, as well as too much speed, as well as their opposites are dangerous. to much looseness, instant drawings,aside from mistakes, there’s no will of the spirit, only the bodies. 3. perspective is of sum importance, it;s a law of manipulation in the good sense, to hypnotise the reader. it;s good to work in real spaces, more that with photos, to exercise our reading of perspective. Blexbolex has cracked the code. The French cartoonist with the name that sounds like a friendly robot has worked in a wide variety of styles, from the simple interlocking blocks of bright color seen in his kid’s books People and Seasons, to the whirls of limited-palette decoration in his very not-kid’s books No Man’s Land and Dogcrime. His most recent book, the truly all-ages fable Ballad, added a profusion of neon dot screening to the mix. Through it all, the constant is that his imagery bypasses people’s critical faculties and hits them right in the pleasure centers, from page directly into eyes and usually from there to the wallet. Putting a Blexbolex book right by the tiller was a great way to grab add-on sales when I was working comics retail. He makes stuff that people want before they even know what it is, just because of how good it looks. Having worked at the National Film Board of Canada for over twenty years, Julie Roy redirected her attentions in the late-2000s from marketing to production, ultimately leading her to the position she holds today as Executive Producer at the NFB’s French Animation Studio. A government of centrists will only take us back to where we were before all this kicked off in 2010. We need to do better than go back to the normal that gave us austerity and Brexit. We need a radical government that can begin the process of reforming our economy so that it works for all working people, that can tackle extreme inequality at the top and reform the press so that it is not a mouthpiece for a wealthy few. A government led from the left are our only real hope of achieving that. Centrists will be an important voice during that government, but they must not stop us ensuring the likes of austerity and Brexit will not happen again.